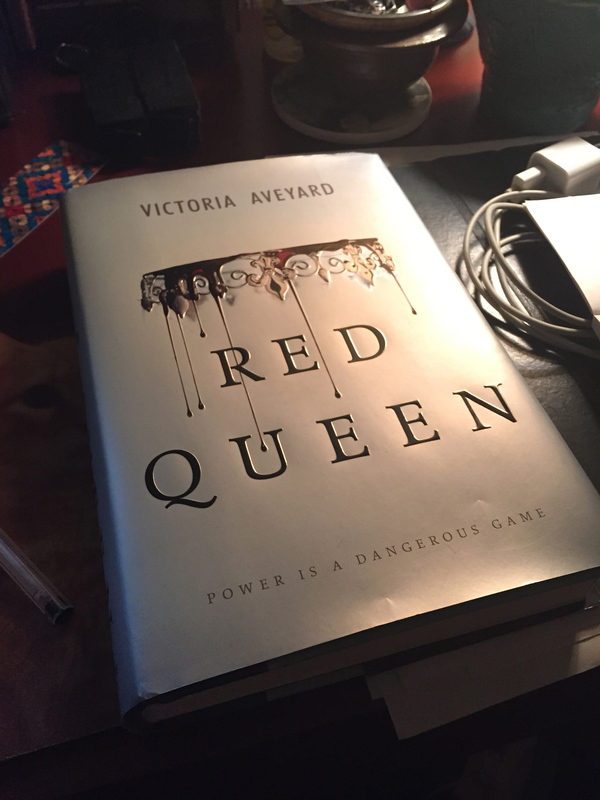 Recently I read a book titled, “Red Queen” by Victoria Aveyard. This is her debut novel after attending the University of Southern California in Los Angeles, graduating with a BFA in screenwriting. There is a link to her personal blog at the beginning of this post and she is also on face book, twitter, and tumblr with the username, “victoriaaveyard”. This fantasy novel begins with a girl named Mare Barrow who we see the story through. In this world, everything is divided by whether you have red blood or silver blood. Red bloods are lower-class citizens who serve the silver bloods and have a hard time getting and keeping necessary resources for their families and themselves. On the other hand, silver bloods are considered to be elite figures who have special powers and all of the authority in this world. Mare, along with many other red bloods, have come to despise and resent the silver bloods for not only reigning over them by force, but also forcing their children to enter the army if they do not have enough money. While this is frustrating, red bloods are powerless, especially facing people who could kill them with a flick of their wrist. However, when Mare finds out that her best friend has been conscripted into the army, she will do anything to stop that from happening. Through her efforts to prevent this, it is revealed that while she may have red blood, she has a power like any other silver blood. Rather than killing her, the king makes her act like she is actually a silver blood and has her get engaged to his youngest son in order to study her and figure out why she has a power when her blood is not silver. As Mare spends more time in the castle and among silver bloods she comes to face mistrust in those around her, questioning her own motives, and betrayal from unexpected places. But through it all she brings forth a new idea of people who are not limited by the color of their blood and will bring a change to the world around them. I personally believe that the theme of this story is that just because there is something that is different between people doesn’t mean that has to define you. You can embrace those differences and be unified. I really enjoyed this book as I am a fan of fantasy fiction novels and I read through it faster than I normally read books. Personally, Queen Elara was my favorite character as I felt she made this really manipulative, but posh villaness. I enjoyed reading the interactions between her and Mare because they both have strong personalities. Also, I appreciated Mare’s thoughts and struggles as she pressed through the story, however I related more to her younger sister, Gisa, as she was considered the “golden child” and Mare was more the “black sheep.” However, they both love each other and, as it is shown in the book, would do anything for each other. I would say more about different characters, however, I don’t want to give anything away. I will admit that it did not end how I thought it would, but I am okay with that and I was satisfied with how the author ended it. This book deals with the physical difference of the color of your blood, but it could relate with any differences in our world today such as race, gender, sexual orientation, disabilities, and other things. But I do believe that as the author writes in her stories that we should be united and not let these things separate us. That doesn’t mean we just not talk about these differences or act like they are not there. However, if we are open about these things and can appreciate that we are not all the same and that’s okay, then that is something to pursue. The sequel is scheduled to come out in 2016 and there have been rumors of a possible movie (although I am not 100% sure about that) but if you are into fantasy or young adult fiction, I recommend it for you and hope you enjoy it. If you have read “Red Queen,” What did you think of it? Who were your favorite characters and why? Did you like where it ended? Was there another theme that stood out to you personally? I would love to hear your thoughts on the matter. I hope you have a good weekend, and I plan to review the Little House on the Prairie Series next week. OMG I would DIE if this became a movie!! I can’t wait for 2016!